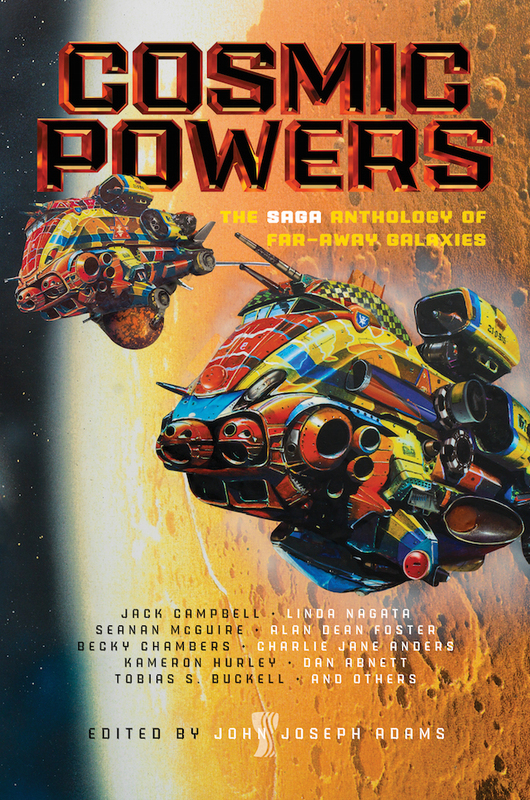 "Wakening Ouroboros," by Jack Campbell [bio] (edited by John Joseph Adams), appeared in Cosmic Powers (RSR review), published on April 18, 2017 by Saga Press. Pro: It’s fun the way the scope of the story gradually increases. No, it’s not classical Mars. No, not a near-future Mars replica. Not even a planet. It’s a least hundreds of thousands of years in the future. No, it’s billions of years in the future! In addition to Genesis 1:3, the “And there was light” line is probably a reference to “The Last Question,” by Isaac Asimov. Con: Both of the characters are very superficial; we feel nothing for them, even as they go to their deaths. It’s hard to see how something as tiny as a Dyson Sphere would help or hinder the universe's expansion and (possible) contraction. This was a bit so-so. The protag is remarkably passive and accepting of what he's told. Some stronger characterisation would have made that play better. But how to characterize a person who's over a billion years old?